Rinse the quinoa on a sieve under cold water for 2 minutes then cover 1¼ cups of water and cook until all the water evaporates. Then remove from the heat and leave aside to steam for 10 minutes. Then fluff with a fork. Grill the corn in a pan or on the BBQ until softened and charred, cut off the core. Add the mayo, sour cream, lemon, chipotle, olive oil in a bowl and blend with a stick blender until smooth and combined, check for season and adjust with salt if needed. This can be done ahead of time and reserved in an airtight container. 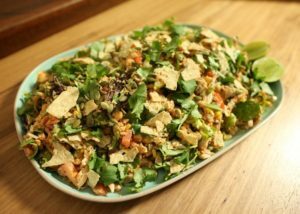 Add the chicken, lettuce leaf mix, tomatoes, onion, cucumbers, corn, chickpeas, quinoa and ¾ of the coriander leaves in a bowl and mix together until combined. Pour over half the dressing to start with and gently toss through the salad. Add ½ the corn chips, pumpkins seeds and jalapenos, gently mix together.